At its heart, Governance is a relationship between a nation’s people and those who lead them. The nature of a country’s Governance has a material impact on the economic and social wellbeing of its population, and thereby its prosperity. The Prosperity Index measures four critical aspects of Governance. First, government must share a commitment to the rule of law, meaning that citizens have confidence in the strength and rules of society. Second, there must be government integrity: the government must operate in a transparent and predictable manner. Third, government must perform well, which means that they are effective at creating the conditions that allow businesses to grow and succeed, as well as providing opportunities for human flourishing through social policy. Finally, there must be political participation, so that as many people as possible feel appropriately represented in the political process. Whilst some countries have maintained relative prosperity without exhibiting strength in all aspects of Governance, we have found that the world’s most prosperous countries are those that have had consistently high Governance scores. Without secure Governance, countries cannot attract foreign investment, businesses find it harder to grow and citizens cannot hold a government to account. This year’s findings reveal an overall improvement in Governance globally, with 98 out of 149 countries’ scores improving. Furthermore, on aggregate, every region improved; and there are several encouraging examples of countries making significant progress on government accountability. Tunisia appears to have seized a number of the opportunities presented by the Arab Spring. Some of this improvement has resulted from the implementation of its new constitution in 2014. Tunisia appears to have seized a number of the opportunities presented by the Arab Spring. Some of this improvement has resulted from the implementation of its new constitution in 2014, which has increased government transparency and accountability, and strengthened the integrity of several important institutions. It also declared men and women equal before the law. Political participation has also increased in the wake of the democratisation, which resulted from the uprisings of 2011, following the overthrow of former president Ben Ali. However, Governance in Tunisia remains fragile. 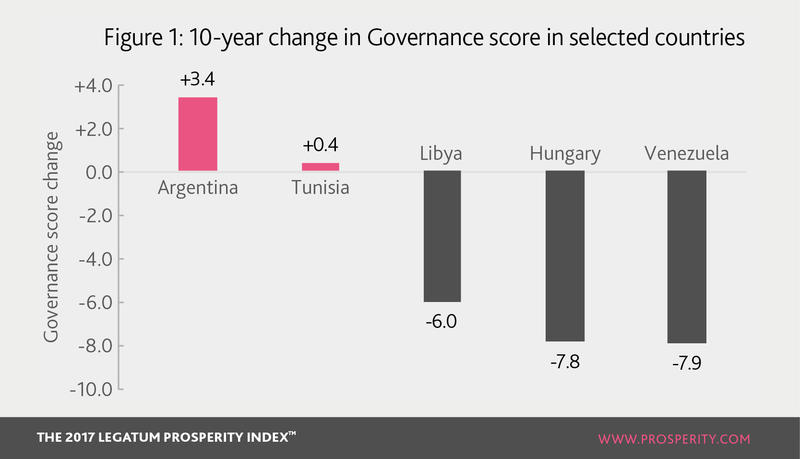 The Prosperity Index shows that government performance has been poor. Though improved, the ability of the government to deliver key services remains weak; and recent examples of state interference in the media have reduced public confidence in the government’s integrity. Subsequently, little progress has been made this year in generating economic growth, social capital and social wellbeing. Argentina is another example of improving Governance. It has experienced a promising improvement in its rule of law in 2017, due largely to more business leaders perceiving that regulation is easier to challenge and that judges were more independent. This has helped to improve economic growth and additional private sector development. It is not only easier and more attractive to do business in Argentina, but there is greater confidence that investments will be protected. This improvement complements key economic reforms, initiated by President Macri following his election in 2015, such as the removal of tariffs and the floatation of the peso. This year’s findings highlight a continued significant decline in the quality of Hungary’s governance over the past decade, falling from 39th in 2007 to 56th in 2017. This has resulted from a steady deterioration in judicial independence and political rights. It was once a model country for its post-communist transition to a two-party parliamentary system, while also leading the way in applying for EU membership. However, Hungary today has seen its progressive political reforms take a different direction since Fidesz, the nationalist party led by the current Prime Minister Viktor Orbán, swept to power after winning a landslide victory at the 2010 elections. Holding two-thirds of the seats in parliament, the Orbán administration had a free hand to reset the tone in Hungary’s political system. Step by step, it pushed through a new constitution, adopted a new electoral law, and appointed pro-Fidesz judges to a majority of seats on the Constitutional Court. Unsurprisingly, Hungary’s judicial independence is lower now than it was in 2007, and it has a lower rating in almost every other Governance indicator than it did a decade ago. In Libya, there were promising signs that increased political participation would lead to other aspects of Governance improving after the overthrow of Colonel Gaddafi in 2011. In the aftermath, there were initial improvements to democracy and political rights, both captured by the Index. Yet promised reforms have not yet materialised and political participation remains limited. In Libya, there were promising signs that increased political participation would lead to other aspects of Governance improving after the overthrow of Colonel Gaddafi in 2011. Turnout at the 2014 elections was just 16% of the total voting age population. Public confidence in political and other key institutions has worsened, especially the judiciary and the rule of law, due in large part to the lack of a single, central government. In the absence of an effective and accountable government, political and economic freedom has deteriorated, whilst instability and corruption have increased. Consequently, any improvements in political participation as a result of the Arab Spring have been lost. The decline in Venezuela’s ranking accelerated during 2017, continuing a steady deterioration of all aspects of Governance which began under President Maduro’s predecessor Hugo Chavez. Chavez’s widespread nationalisation of businesses showed a lack of respect for property rights of domestic and foreign owners, resulting in a predictably sharp decline in foreign investment and private sector development. The failure to respect property rights has meant that there is now little incentive for foreign investment or private enterprise. Further, political participation has become less meaningful. The result of the most recent election in 2015 was not respected. Following his party’s defeat, President Maduro refused to hand over power, side-lining the National Assembly and replacing members of the Supreme Court. It is not surprising, therefore, that the Index shows the percentage of people with confidence in the honesty of elections has fallen from 64% in 2007 to 21% in 2017. Poor political participation leads to poor accountability for government. This has reduced the pressure on the Venezuelan government to be effective or to act with integrity. In turn, this is reflected in a number of indicators, for example the percentage of people with confidence in the national government has fallen from 63% to 16%. This fall in the quality of Governance has had an enormous effect on Venezuelan prosperity, which has fallen from 85th to 132nd globally since 2007. Perhaps one of the most shocking examples is the recent food crisis, with the Index showing that 80% of people have had times in the last 12 months when they have not had enough food to feed themselves or their families, up from 45% last year and 25% in 2007. Lessons for prosperity: what matters for good Governance? This year’s Prosperity Index again finds that countries with the highest prosperity scores generally perform well in all areas of Governance. The countries described display a number of strengths and weaknesses relating to how their governments’ function. But the core difference between good and bad governance is how the rights of citizens are respected. Where they are not respected, there is poor representation and government does not constrain itself to the law. But where rights are respected, citizens are represented appropriately, their lives and property are protected, and government does not over-reach into their lives. This is the relationship between people and those who lead them that leads to greater prosperity.